Last year, the A-Z sounded like a fun and interesting challenge. I wanted to see whether I could post thirty days in a row, and I did. At the end I felt like I’d been pushing myself hard, but 2011 was a better A-Z challenge year for me in many ways. I was smart enough to write a few days in advance and only covered a writing related subject, as well as a Jamaican food item. This year, I got more inventive and did people, places and things Jamaican. This seemed to work well, as the people who came by found the information interesting. The only down side was that I was so busy with life, writing projects and editing deadlines that I didn’t make a serious attempt to write up the posts before April 1. Big mistake, which meant that in addition to writing on the same day, I had to make visits and cram in everything else that forms part of a normal day. I made a lot more connections last year than this year, but again, that might be because of time constraints and I did notice that I didn’t get return visits from a fair number of those I visited. Or maybe they did come by, but didn’t comment. That said, I’ve met some really lovely people, who I’m sure will remain blogging buddies. I think it would be useful—if the organizers can swing it next year—to have some way of keeping the blogs with the same subject areas listed together so that it will be easy for bloggers to focus on the areas they interesting, such as music, writing, writers, books, etc. I'm not suggesting this as a way to limit visits, but it would make it easier to find the blogs that spark particular interest. (I'm harum-scarum, so I most of the time, I don't even use Google Reader). I certainly didn’t make it to all the blogs, but did make as many visits as I could. Many thanks to the organizers of the challenge. It’s a wonderful idea that has not only inspired people to write over a sustained period, but other people have come up with their own variation on the A-Z theme. I don’t know how the hosts managed to write their own posts, visit others and also deal with the hundred other issues that I’m sure cropped up during the month. They are blogging heroes, with Arlee Bird being the ringleader. May the connections we’ve made lead to long and lasting friendships! 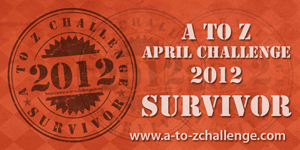 And do visit the other bloggers who are posting their thoughts on this year's A-Z Challenge. I noticed the same thing about return visits. Some did come by, though, and I found really interesting blogs. I'm thinking that maybe some folks didn't understand the concept of checking in with others who'd visited. I know it's common for many of us when we just start blogging. It's good to know that you enjoyed the challenge and that you made some meaningful connections. Thanks, Julie. I don't think we can ever have enough friends in the writing world. I tried to visit new people as much as possible. There were times when I thought, "Oh, my topic must not be interesting to people!" but I know I had such a great time on my own, the comments were less important than the research and how much I was growing. Those who did visit repeatedly enjoyed my words. That became priceless to me. I never made it to your blog, for example - but I would have enjoyed it now that I know it is out there. I like your suggestion of putting blogs into categories. Excellent. Nice to meet you, Julia. Like you, I learned a lot while I put the posts together. Not sure if I made it to your blog either. Thanks for stopping in. Joy--one of the biggest finds of my challenge last year was you. This year I was a bit like a shot chicken, running around, which meant I couldn't visit you as often as I would have liked to. I hope to change that now. Same here, Damyani. Reading your writing is always a treat. No problem on the visits. The organizing team had a lot of ground to cover, so that's understandable. No problem on the guest post. I'd be delighted. I'll go look at the guidelines on your site. Not sure this response leads anywhere but here, but just in case it does, I sent you email relating to the reflections post. I guess the real solution would be to have longer days, but since we can't do that we make do with what we have at hand. I think a lot of people were just overwhelmed by the visiting and weren't sure what to do when they came to a new blog. I got quite a few comments, but they were mostly from the bloggers who typically visit my site--not a whole lot of new ones I don't think. But it gets difficult to keep track of it all. We'll keep listening to suggestions and see what improvements we can come up with in the future. I really did learn a lot about Jamaica. I love the bits about Jamaican history like Port Royal and the earthquakes. Also the haunted houses. I'm happy for that. Loved what you did. That was very creative and just what I expect from you. I know a lot of work must have gone into crafting 26 stories to reflect the 'death by...' subject you chose. I lurked in your blog a couple times Joy. I lurked a lot of places, as I didn't participate in A-Z. The number of participants was intimidating. Thanks, Donna. It's a great concept and I believe many of us would have benefitted more if we'd made more visits. I guess some in the challenge were also intimidated and maybe didn't reach out as they have very few visits. I tended to neglect blogs I was already following n favour of new ones (there were so many I didn't think I could do it any other way). Will hopefully get to visit a few more blogs now that the challenge is over. Moody, that happened to me too, something the organizers suggest we not do. :) I totally understand though and friends are there, come what may. I haven't tried a challenge yet, and I bow down to all of you who can keep up with the posts! I'm sure the connections and friendships formed are wonderful. I barely made it this year because I didn't write the posts in advance. It's a lot to take on when you have stuff to write and edit, but the new connections make it worthwhile. Glad I made it too. Same here, Mina. So happy to have connected with you. I'm so glad we connected through the challenge! You had some amazing posts and the Jamaican musicians that you mentioned really resonated with me... I just wasn't able to visit and comment every day. It's bad enough that I was darting here and there, from one blog to the next, lurking here... lurking there... soaking up as much as I could possibly take in, sometimes forgetting or not able to leave a comment... it was super-hectic! Thanks for visiting my place during the challenge, Joy! Check out my reflections post - I've given you a shout out! Michelle, so glad I connected with you too. I learned so much more about music than I know before, and with some lovely stories too. I really enjoyed your posts (and enjoy your blog anyway). I like your idea of dividing the participants by category. What genius! I know I didn't even do the five-a-day that was recommended. I found blogs I really liked and stuck with those b/c the list was so overwhelming. The thought of visiting 1700 blog was mind-blowing. Not sure how many I got to, but I tried. :) Enjoyed your musical posts. I followed a couple other people doing posts related to bands, as well. Half the people I met during A to Z will probably never visit again. Blogging is such a fickle thing. The only way anyone visits you is if you are faithful and visit them too. I don't mind that at all...just sayin' that's how it is with these bloggy fests. That's so true, Mike. Most of us will first visit those who come regularly and then everybody else after. I do realize that if I slack off, I lose people. I didn't get to do the challenge myself, but I did read lots of interesting posts and will continue to visit some of the new blogs I discovered. I was in the same boat, and I always felt like I was sinking. Just as soon as I got my head above water, I was once again behind! Next year, I will write more in advance! Thanks, Jay. It was indeed an uphill battle. Glad I made it through. I enjoyed your posts - the Jamaican theme was great! I had the same situation with some unreturned posts, but I was thrilled to find many blogs I'll continue to follow! Jemi, yes, I too discovered some really interesting bloggers and entertaining posts. Nice meeting you too, Kela. That's something to think about..,I wasn't sure if the person commenting was a newbie to my blog, or one I had visited already. Although I was faithful at visiting and commenting on 10 blogs a day, I might not have noticed the new visitors. Congrats for finishing the Challenge! I learned a lot about Jamaica through your blog. One of the upsides of A to Z! And I learned about bands I'd never heard of before, through you. Yes, that track back is a wonderful idea, but something I've been too lazy to try because I know my icon links to my blog, etc. Hi Joy, I assumed you must have been busy, but you did an excellent job researching, writing and commenting. Hey, Peaches, thanks. I'm soooooo glad the Challenge is over. I hear you when you say about how busy the challenge was - writing the posts, visiting others and trying to carry on with the frenetic activities of everyday life! Even having pre-scheduled all my posts before the challenge started I found it hard to visit as many blogs as I'd have liked - mind you, some of that was because a number of bloggers wrote so much that it took ages to read through and them comment afterwards! Anyway - the links are all still 'live' so I plan to try and work my way through them over the coming months! Sue, one of the things they organizers did talk about was the length of our posts - to keep them manageable based on the amount of people to be visited. I had to condense all I wanted to say in a paragraph. There was a time or two when I had to go 2-3 paragraphs, based on the person/place or thing being discussed. Glad to hear you're using the blogger experience to challenge yourself in interesting ways. I'm far too anti-social to try anything comparable. Thanks for dropping in. I'm not all that sociable, but blogging has helped me escape my shell over time. Interesting discourse on your blog re those slave movies. I loved reading about your Jamaican people and fruit/vege everyday! And I visited daily to read even though didn't leave comments on every post! You gave me an interesting month! Thanks! Thanks so much. Appreciate the visits. Visiting from A/Z post challenge reflections; seemed like you had a good theme with Jamaica! This was my first year to participate and I signed up the last few days of March. Knowing what I know now, I think if I do it next year I'll write posts in March in anticipation of April to spend April visiting new blogs. I did visit at leats 10 a day but would have loved to have had the time to visit more. Congrats for finishing two years in a row! Advance planning has a lot of advantages and for me hindsight is, of course, 20/20. It was an extra busy time for me, but I'm glad I met many bloggers. Your theme was great. I learned so much about Jamaica. I don't remember much about April, but I did have fun preparing the posts. It was hard going close to the end, but I got there, thankfully. I think I have the same thing as you do... Last year was a much better year for me - I actually managed TWO blogs, and had no problem visiting others... but this year is a whole new story, I struggled. Just popped in to say hello from a fellow A-Zer! Thanks for dropping in. For me, April passed in a whirl which would have been better managed if I'd managed to write something in advance. I had plans, but those went out the window. Wow, Joy, I don't know how you pulled it all off. I want to give the A-Z a shot next year, but I know I need to start on it now if it's going to happen. And even now I have a million irons in the fire, but I want to do the challenge at least once! I mentioned you on my blog today! Lynn, it's a great experience and it would work very well if you're tying it in to a project you're doing. Like you, I have way too much going on, but we can only get so much done in a day, no matter what we think. Thanks for the shout out. The subject areas sounds like a good idea. I loved your theme and am itching to visit Jamaica now. : ) I really can't imagine how much work must have been involved with this challenge. Congratulations on finishing it! Most impressive. I do hope you get to visit Jamaica one day. Yes, it was fun this year, but things did seem a little crazier this year in spite of me going on a ten day trip to Ireland last year. Go figure. I wasn't able to repeatedly visit as many blogs this year as I'd had liked. It was just too large. The Challenge definitely is mega-sized. It does take some doing to be organized enough to make the rounds and write too. Got next to nothing written in April - outside of blog posts, that is. I know, there was really more blogs I wanted to visit but didn't get a chance to. I saved the A-Z homw page on my fav. and now I go back and catch up. It's easier when I'm not writing everyday myself. Yes, doing this stuff when you're not writing is soooo much easier. Thanks for swinging by. I'm truly in awe of all those who participated in the challenge. I don't know you managed! I loved it because it provided the opportunity for me to discover so many wonderful new blogs. I'm glad I came across yours too. You do the coolest cartoons. Added you to my blog roll so as not to lose track of your blog. Congratulation on finishing the challenge. I didn't visit all blogs during the challenge but, cross my heart, I'm visiting every single one with reflections post! Ooh, I think grouping the blogs (the way Rach does in her campaign) is a great idea. Then we could dip into groups that seemed interesting, while not forgetting writer friends (which I worried I was doing - especially once I was on vacation and fell back on commenting). I think I've definitely neglected a few people. I don't think the challenge would lose anything be putting in categories. After an initial scroll through of someone's blog, I get a good idea whether or not the content is for me.